China’s new leaders vowed to maintain sustainable growth for the world’s second biggest economy and “pursue a renaissance of the Chinese nation” at yesterday’s conclusion of an annual parliamentary session that completed the transfer of power to a new leadership. In his maiden speech as head of state, Xi Jinping invoked his favourite concept of the “China dream” and laid out a vision of a stronger nation with a higher standard of living for its 1.3 billion people. during his administration. New Premier Li Keqiang, speaking later at a news conference in the Great Hall of the People that wrapped up the two-week annual session of the National People’s Congress, gave assurances that the new government’s top priority would be to maintain stable growth and that his administration was up to the task, a message likely to be applauded by investors and the market. Both Xi and Li stressed the necessity of deepening reform to deliver sustained growth but neither mentioned systematic political reform. Painting his vision of a great renaissance of the nation, Xi stressed that the “China dream” could only be realised by seeking “China’s own path,” cultivating patriotism and following the Communist Party’s leadership. “We must continue to strive to achieve the China dream and the nation’s great revival,” he said. Analysts say Xi’s speech outlined lofty goals but stopped short of mentioning initiatives that would have real impact. On a more down-to-earth note, Li defined the areas of reform for his cabinet in his 107-minute-long debut press conference as premier. They focused on administrative streamlining to make governance more efficient. These included transforming government roles and functions, simplifying bureaucratic procedures and delegating power. “Right now, there are more than 1,700 items that still require the approval of State Council departments… We’re determined to cut that figure by at least one third,” Li promised. In an effort to show his determination to tackle the obstacles in pushing forward economic reform, he said: “Sometimes stirring vested interests may be more difficult that stirring the soul. Lu Ting, an economist at Bank of America Merrill Lynch, welcomed Li’s remarks. “He understood very well that key barriers for reforms are vested interests rather than ideology, or ‘soul’ in his words, and he promised to tread uncharted waters,” Lu said. With China’s economic environment expected to remain “severe and complex”, the government will aim to manage latent risks to avoid “big fluctuations” in economic performance, Li said. Zhang Ming, a political science professor at Renmin University, said such goals indicated China would not see radical changes in the near future. The First Session of China’s 12th National Congress on March 6-17 concluded with official approval of Xi Jinping and Li Keqiang for the posts of president and premier, ending a once-in-a decade change of the country’s top jobs and commencing a new era for China. The outside world and the majority of Chinese are as uncertain as Xi and his Politburo colleagues as to what the new era will bring. 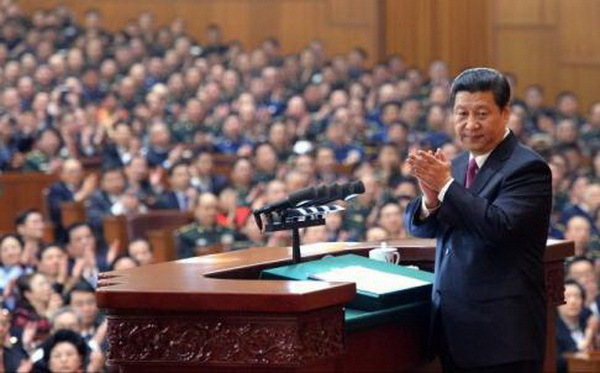 Xi’s 25-minute-long speech to about 3,000 members of the Congress on March 17 neither shed any light on his thinking about the future nor clarified his views of the nature and characteristics of the “Pax Sinica”, though eight of 17 paragraphs in his speech mentioned the “China Dream of Renaissance” – a reference to the glorious times of past dynasties such as the Han (206 BC-220 AD), Tang (618-907) or Qing (1644-1912), during which China prospered economically and succeeded in unifying and incorporating vast areas into its territories. Thanks to these developments, China took the name of the Middle Kingdom, considered itself the center of the universe, and established a wide network of tributary relationships with its neighbors, a system that ceased to exist with the demise of the Qing. The “Dream of the Renaissance” of a powerful China has preoccupied China’s leaders since 1949. During the 1950s, Mao Zedong, resorting to utopian and illogical measures, unveiled the Great Leap Forward campaign with an aim of transforming China from an agrarian economy into a modern society through rapid industrialization and collectivization. In the end, the campaign was disastrous economically and socially, resulted in the Great Famine, turned into the Great Leap Backward, and brought China to the brink of social collapse. Deng Xiaoping started reforms in 1978 with four ambitious modernizations with less focus on ideology and greater importance to pragmatism, captured in his famous axiom: “It doesn’t matter whether a cat is white or black as long as it catches mice.” Deng’s economic reforms transformed China from a backward and isolated society into a global power, creating every favorable conditions for Xi to invoke a Great Renaissance of the Chinese nation. Xi Jinping, too, has indulged this penchant for grand dreams. Unlike Mao’s utopian dream, however, Xi’s vision of China is more realistic and couched in a more reasoned sense of China’s historic past and its presumed destiny for at least four reasons. First, after surpassing Japan to become the second-largest economy in 2010, China continues to maintain strong economic growth. If it is able to maintain the growth rate of the past 20 years, China will become the world’s largest economy by 2030. The emphasis on the Dream of Renaissance on Xi’s watch, seen in this context, is aimed at reminding the Chinese nation of the glorious past and asking for more sacrifice from the people to realize this great ambition. Second, Xi’s vision, insofar as we can tell from his public comments, reflects a sense that being a big economy by no means assures China of long-lasting global power and status. Moreover, as illustrated by China’s model of economic growth in the past decades, Xi seems to sense that putting emphasis on economic growth alone, while neglecting sustainability-related issues such as quality of development, corruption, the gap in incomes, development, pollution, and so forth has resulted in social tension as the economy expands. That is why China’s double-digit growth rate in the past decade is admired throughout the world, but many Chinese consider this period a “lost decade”. Xi has not pushed aside basic economic realities. Currently, the Chinese economy accounts for 9% of global GDP output, and by the time China surpasses the US as the world’s No. 1 economy, its GDP may account for 20% of world GDP – but national leaders such as Xi seem to have grasped that this is still small when compared to the 58% of global GDP China accounted for during the peak of its power under the Tang Dynasty. China maintained its economic dominance until 1830 when its GDP accounted for “only” 30% of the world’s total. However, it did not protect China from being attacked and torn apart by smaller powers of the West during the Century of Humiliation. That was due to the fact that China was a big state, but a weak nation that was not well armed and which failed to master advanced technology of the time. Third, while details of China’s Dream of Renaissance are being developed by China’s leaders, ordinary Chinese are crafting little dreams of their own. These include the desire to live in a prosperous and democratic society, free from pollution and corruption, and with access to the benefits of a Chinese economic renaissance in an equitable manner. The big question – how the state’s and people’s Dreams of Renaissance can be enforced harmoniously – remains unanswered. Xi comes to power as these “little dreams” are becoming more politically consequential for China’s leadership. Finally, the international community has every reason to welcome a peaceful and prosperous rising China. What China’s neighbors don’t want to see is this Dream of Renaissance used as a cudgel to make China the dominant force at the center of the international economic and political system of the 21st century, while leaving neighbors in a semi-dependent position reminiscent of the tributary system of the past. Xi’s appreciation of the character of international relations in this century, and his sense of China’s relations with the countries on its immediate periphery, seem to take into account the sensitivities of these links and the realities that are likely to confront China’s efforts to managing complex relations during the new leadership’s tenure. To achieve the China Dream, [we] must walk the Chinese path. To achieve the China Dream, [we] must exalt the Chinese spirit. To achieve the China Dream, [we] must unify the Chinese strength. These are the commitments of the leaders of the Republic to the people: We cannot hold the slightest complacency, there can be no slacking-off, [we] must redouble our efforts and, [with] our indomitable will, continue to push forward the cause of socialism with Chinese characteristics and strive to achieve the Chinese dream of the great renaissance of the Chinese nation. As I’ve traveled around China over the past few weeks, I have been struck by the speed with which a political slogan, even in this age of digital noise and distraction, can still enter the bloodstream and filter down through layers of thought and expectation until it reaches Mrs. Jin. Mrs. Jin is embroiled in a lawsuit that might or might not let her stay in that house, a bare-walled two-story brick block. It’s an interesting story, and I just might write it up someday. But for now the more pressing point is this: Xi Jinping has sought to inspire his people by raising the flag of the China Dream, but they have interpreted it as China Dreams—plural. Talk to just about anyone these days and she can tell you what she wants, what is standing between her and her goals, and how she will define success in reaching it. And that—the proliferation of 1.3 billion China Dreams—will prove either the wisdom of the concept or the potential danger embedded it. See also an essay by Perry Link and CDT’s Xiao Qiang which discusses one element missing from the official “Chinese Dream”: individual dignity.